Why You Shouldn’t Be a Single-Issue Lover – Love. Life. Practice. You know that idea of bringing two groups together so they can see that they’re just people and come to consensus and smile and break bread together because after all, we’re just people, right? Yeah. That doesn’t work too well. In fact, it pretty much just highlights and strengthens whatever us-vs-them mindset was already in place. It is Fox vs. Comedy Central, Red vs. Blue, Steelers vs. Packers, Android vs. Apple (used to be “Microsoft vs. Apple”, but we won that one). When I was in the USMC it was the tail end of the cold war, and we were training to “kill commies.” One day, on a whim, I pulled out a notebook and walked around the squad bay asking my fellow Marines: “What exactly is a commie?” Out of 40+ lean green fighting machines, only two had any actual understanding of the politics of communism. Everyone else basically gave a variation of “Commies? They’re the ones trying to take our freedom, so we have to kill them.” There’s not much room in that mindset to find commonality with the other. What Systems-Centered theory suggests, instead, is that groups separate. Focus on their own members. Stay apart, and by being insulated from “the other” they begin to notice their own differences within the group. Whatever single-issue united them against the other group becomes less important because it is not threatened. This is called “Functional Subgrouping” and what it does is eventually dissolve the simple barriers of the two groups to create a more complex system with more resources to solve problems. Obviously this is a vastly simplified description of a complex process – but remember, complex is different than complicated. A tangle of yarn is complicated; a knitted scarf is complex. Same material only made different by the application of some kind of protocol – usually the simpler, the better. I experience this all the time at Open Spaces where I facilitate. It’s four simple principles and one law that change a mob of people into a passionate group creating and learning together. While this method is used to solve problems within groups that are having trouble working together, I prefer to start more local. As in, with myself. 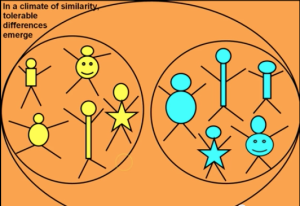 If I’m already aware of the fact that I’m not just a “blue” but also a “skinny smiley faced blue“, I’m more likely to recognize other smiley faces regardless of their size or color. sketching, writing, a-capella music, the cinematic oeuvre of Keanu Reeves, ukiyo-e prints, hand-drawn typography, nose pin-ups, Henry rifles, jazz dance, whiskey old enough to vote, the sound of a woman speaking Russian, kneading dough. That’s just the initial list; even as I sit here I’m thinking of other things: fine-crafted writing instruments. The wind as I ride my bike around the lake. Hearing my grandson laugh. Having a big breakfast with Natasha. The sound of a well-narrated audiobook as I walk through an airport towards my next flight. We could all fill pages with the things that we love, because we all love lots of things if we let ourselves remember it. I think that ten seconds is a good start, though. That list is important. When you meet someone who is not on the same page you are then you can remember: we are not single-page books. There are many pages that came before, and many more yet to be written after. I know, this is kind of a sneaky “do what you love” post, but it’s recursive: Do what you love and you’ll be doing what you love. That’s all. What’s your 10-second list? I’d love to see it in the comments; then send this post to a friend and see what their list looks like! That feeling I get from finishing a knitting project, the zebra noise my dog makes in her sleep, the smell of my grandma, old books, vintage photos, standing outside with my eyes closed feeling the breeze, the smell of bread baking, fresh fallen snow.